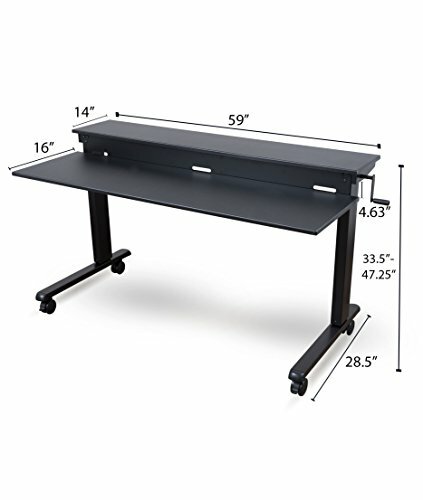 An adjustable standing desk designed to help business executives be more productive. 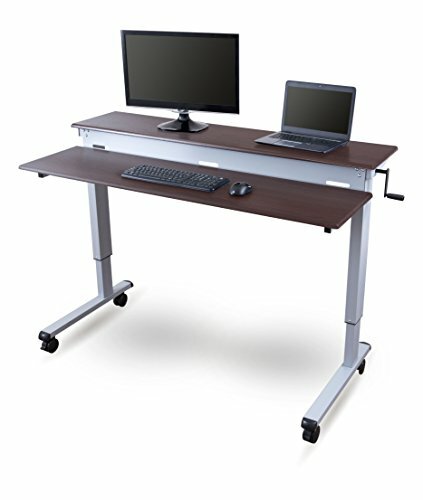 Improve your mental alertness, productiveness, posture and wellbeing with this standing desk. Crank adjusts from 28.875″ to 42.625″ (lower surface) and 33.5″ to 47.25″ (upper surface). With a 59” wide work surface, two-tier shelf design, the innovative table is certified by the not‐for-profit trade association for Business and Institutional Furniture Manufacturers (BIFMA) and can take a maximum load of 154lbs. Two model sizes: 48” and 60”. In this classy design, you have option to adjust the height of the work surface easily. At an affordable price you can invest in a sturdy desk which not only looks stylish, but helps combat bodily pressures from sitting too long. The Crank Adjustable Stand Desk give you the freedom and flexibility to move and work throughout the day. Crank up your productivity today!